Apple has released the next version of major firmware update for iPhone and iPod touch, now renamed as iOS. Previously, the firmware update was named as iPhone OS software update. 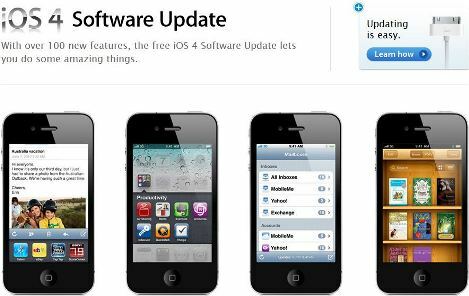 The latest version of software update, iOS 4.0, is only available for iPhone 3G, iPhone 3Gs, second and third generation iPod touch (iPhone 4 already factory loaded with iOS 4 prior to shipping). In other words, classic iPhone 2G and first generation iPod touch won’t be able to upgrade to iOS 4. Multitasking (not supported on iPhone 3G and iPod touch) with fast switching support. Folders to organize apps with up to 12 apps in a folder. iBooks eBook reader and store. Tap to focus video recording. Faces and Places in Photos. Ability to manager folders in iTunes. “Large Text” option to increase next size in Mail, Contacts, Messages and Notes. New international calender option for Gregorian, Japanese, Buddhist, and Republic of China calendars. Character count of SMS text messages. Support iMovie video editing paid app. With the release of iOS 4, iOS 2 (iPhone OS 2.x) will no longer be supported by the App Store, where developers are required to develop new apps and updates to existing applications with iPhone SDK 4. A new iOS 4 Apps section has also made available on the iTunes App Store, which is also accessible from the “Featured” menu on the App Store to highlight apps that taking advantage of unique features of iOS 4.
iOS 4.0 build 8A293 can be downloaded via iTunes 9.2 by simply plugging in the supported iPhone and iPod touch models. iTunes should prompt a update notification that allows user to upgrade the firmware on the mobile device once the detection is completed. Alternatively, download the iOS 4.0 with the direct download links below. The Golden Master (GM) candidate (build 8A293) which was released to developers earlier may not be the same with the official final release of iOS 4.0. Although the build number is identical, the final version released to the public does not include the game center, but includes some new bug fixes.